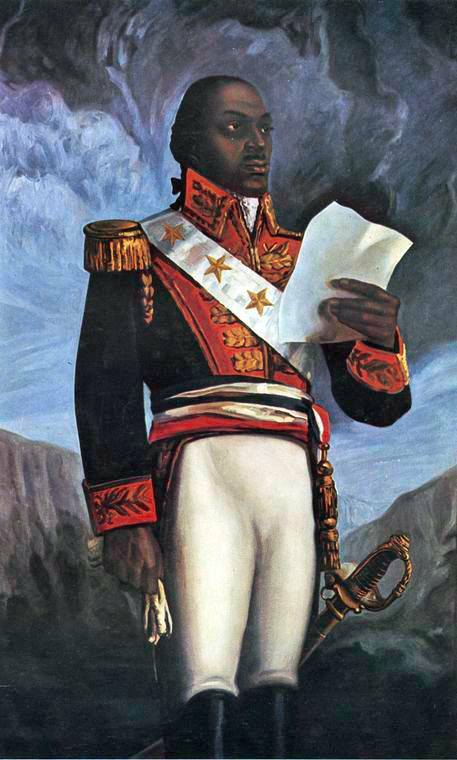 Known to his contemporaries as “The Black Napoleon,” Toussaint L’Ouverture was a former slave who rose to become the leader of the only successful slave revolt in modern history that created an independent state, the Haitian Revolution. Born into slavery on May 20, 1743 in the French colony of Saint Dominque, L’Ouverture was the eldest son of Gaou Guinon, an African prince who was captured by slavers. At a time when revisions to the French Code Noir (Black Code) legalized the harsh treatment of slaves as property, young L’ Overture instead inspired kindness from those in authority over him. His godfather, the priest Simon Baptiste, for example, taught him to read and write. Impressed by L’Ouverture, Bayon de Libertad, the manager of the Breda plantation on which L’Ouverture was born, allowed him unlimited access to his personal library. By the time he was twenty, the well-read and tri-lingual L’Ouverture—he spoke French, Creole, and some Latin—had also gained a reputation as a skilled horseman and for his knowledge of medicinal plants and herbs. More importantly, L’Ouverture had secured his freedom from de Libertad even as he continued to manage his former owner’s household personnel and to act as his coachman. Over the course of the next 18 years, L’Ouverture settled into life on the Breda plantation marrying fellow Catholic Suzanne Simon and parenting two sons, Isaac and Saint-Jean. The events of August 22, 1791, the “Night of Fire” in which slaves revolted by setting fire to plantation houses and fields and killing whites, convinced the 48-year-old L’Ouverture that he should join the growing insurgency, although not before securing the safety of his wife and children in the Spanish-controlled eastern half of the island (Santo Domingo) and assuring that Bayon de Libertad and his wife were safely onboard a ship bound for the United States. Inspired by French Revolutionary ideology and angered by generations of abuse at the hands of white planters, the initial slave uprising was quelled within several days, but ongoing fighting between the slaves, free blacks, and planters continued. Although he was free, L’Ouverture joined the slave insurgency and quickly developed a reputation first as a capable soldier and then as military secretary to Georges Biassou, one of the insurgency’s leaders. When the insurgency’s leadership chose to ally itself with Spain against France, L’Ouverture followed. Threatened by Spain and Britain’s attempts to control the island, the French National Convention acted to preserve its colonial rule in 1794 by securing the loyalty of the black population; France granted citizenship rights and freedom to all blacks within the empire. L’Ouverture’s actions eventually aroused the ire of Napoleon Bonaparte. In 1802 Napoleon dispatched his brother-in-law, Charles Leclerc, to capture L’Ouverture and return the island to slavery under French control. Captured and imprisoned at Fort de Joux in France, L’Ouverture died of pneumonia on April 7, 1803. Independence for Saint Dominque would follow one year later under the leadership of Jean-Jacques Dessalines, one of L’Ouverture’s generals. Laurent Dubois, Avengers of the New World: The Story of the Haitian Revolution (Cambridge: Harvard University Press, 2004); Martin Ros, Night of Fire: The Black Napoleon and the Battle for Haiti (New York: Sarpedon, 1994).